Alloy vacuum melting furnace heating temperature, fast melting, in the vacuum, the melting process can add other elements. Compact structure, reasonable layout and convenient operation. Type furnace is divided into vertical and horizontal two devices, by the chamber of a stove or furnace, furnace cover, sensors, melting pot, heat preservation material, feed box, cover lifting mechanism, vacuum units, intermediate frequency power supply, temperature instrument. Other specifications can be customized as required. Firstly, the alloy vacuum melting furnace is introduced. 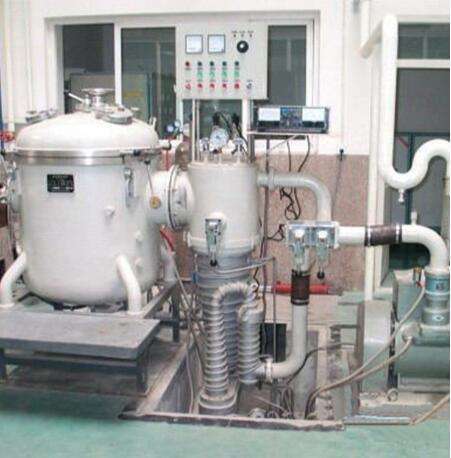 Vacuum induction melting furnace is mainly used in the melting and casting of special steel, high temperature alloy, precision alloy and other vacuum or protecting atmosphere, and also suitable for small parts of vacuum casting. The electric furnace mainly consists of shaft, bracket, sensor, tilting furnace mechanism, vacuum system and intermediate frequency electric control system. The furnace body and the furnace cover are water cooled and laminated, and the furnace body is equipped with alloy feeder, observation window, thermocouple temperature measuring device, sampling device and tamping machine. The electric furnace sensor is coiled into a spiral shape by a different type of copper tube and is rotated by an electrically driven crucible when casting outside the furnace. The vacuum system consists of oil diffusion pump, mechanical pump, lutz pump, filter and various control valves.